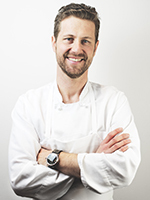 Lachlan Mackinnon-Patterson began his celebrated culinary career in St. Louis, Missouri. After moving to Paris in 1999, he obtained his Certificate d’Aptitude Professionnelle at the renowned Ecole Gregoire-Ferrandi. Moving back to the U.S. in 2001, he worked at Thomas Keller’s The French Laundry in Yountville, California, where he met master sommelier Bobby Stuckey. Inspired by the neighborhood frascas they had visited in Friuli-Venezia Giulia, Mackinnon-Patterson and Stuckey opened their first restaurant, Frasca Food and Wine, in August 2004 in Boulder. In 2007, the partners launched Scarpetta Wines. They opened Pizzeria Locale, a full-service contemporary pizzeria, in January 2011. Mackinnon-Patterson has earned numerous awards, including: Food & Wine magazine’s Best New Chefs 2005; James Beard Foundation Award’s Best Chef: Southwest, 2008; and a season competing on Bravo’s "Top Chef Masters." Start the day with an espresso from Boxcar Coffee and the best croissant in town...these guys do it right! If it’s open, I will always grab a sandwich for lunch from Cured to eat after my bike ride. Generally, I will head out on a ride connecting all of the dirt roads northeast of town. This route avoids traffic and is quiet enough that I can stop from time to time and take a phone call if needed. If I have more time, I will head up one of the canyons for a longer ride toward the Peak to Peak Scenic Byway. For dinner, there is never anything better than Frasca for a great, four- to six-course dinner, with perfect service and enough reading on the wine list that the hours just fly by!